Are you worried about the possibility of carbon monoxide being in your home? And have found yourself searching, Carbon Monoxide Leaks Woodlands TX? Did you know that carbon monoxide is a colorless and odorless gas which is not easily detectable by our senses? Which means you could have carbon monoxide in your home without even realizing it. When there is too much carbon monoxide in the air, your busy begins to replace the oxygen in your red blood cells with carbon monoxide. Which can lead to serious tissue damage or even death because it is essentially poisoning your body. So, how do you know when you have a carbon monoxide leak in your home? Brought to you by Houston Admiral, we are going to highlight a few signs that may point to carbon monoxide being in your home. Because carbon monoxide is hard to detect, you first can examine the symptoms you are experiencing. People who are exposed to carbon monoxide will show flu-like symptoms, headaches, nausea, or light-headedness. If everyone in your home is having similar symptoms when they are in the home and they go away when you are not in the home. This could be an indication of carbon monoxide in the home. Does your house smell stale or stuffy? Or maybe you are noticing a burning smell? These are also a red flag that carbon monoxide could be present. If you see any of these signs, you need to contact the experts at Houston Admiral immediately. The worse thing you can do is to continue breathing this air in. 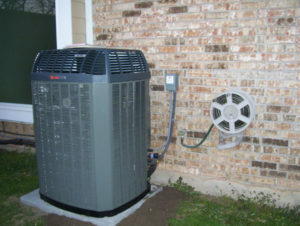 Our expert technicians will come out to your property to inspect and run tests. If we detect carbon monoxide in the air from a leak, we will treat the problem as quickly as possible. Do not waste any more time today and give us a call at 281-876-9400.